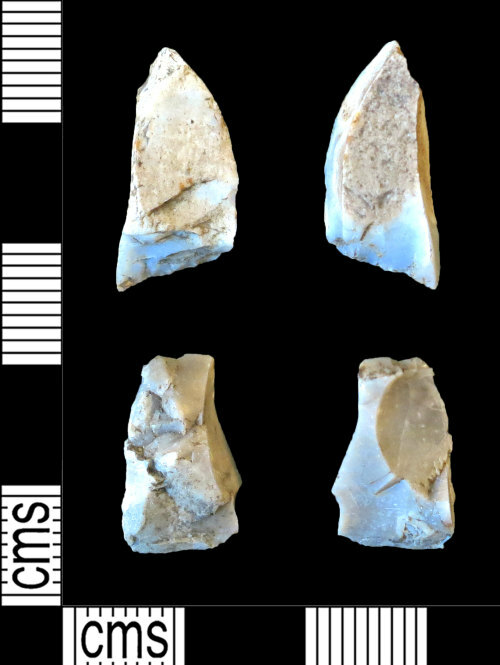 A group of two complete flint pieces of debitage of probable Mesolithic date (9000-3450 BC). The lithics are sub-rectangular in plan and section. The dorsal surfaces both retain minor amount of cortex. Both left and right hand edges have a minor amount of semi-abrupt retouch. The ventral surfaces have multiple small negative scars. The flakes retains a minor amount of cortex along the distal left hand edge and is therefore a secondary flake. Length: 20.01mm, Width: 9.19mm, Thickness: 5.53mm, Weight: 1.20g. Length: 16.12mm, Width: 10.52mm, Thickness: 5.73mm, Weight: 0.90g.